What we have done less systematically is to give you a glimpse about what's going on within CRRC. We will change that, by giving you more updates on work we are doing, people we are working with, and what they're doing. We also want to use this opportunity to set out more clearly why we think that the work we're doing is important, and is a good model of development. For us, it's not one project after another, although it may sometimes feel that way. There's a rationale that we would like to share with a broader audience. Senator Patrick Moynihan coined the phrase that "Everyone is entitled to his own opinion, but not to his own facts." Essentially, what CRRC seeks to contribute is facts, so that people can have more than just an opinion. That, in a nutshell, is what quality research in a transition context should be about. 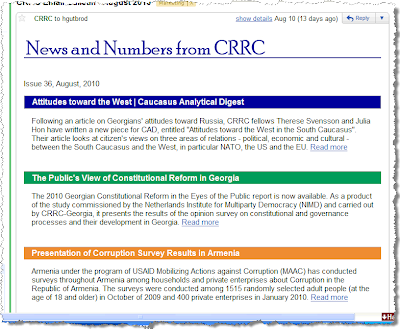 Put us into your CSS feed for more regular updates, and consider subscribing to our new e-bulletin, relaunched as News & Numbers from CRRC. You find details here.